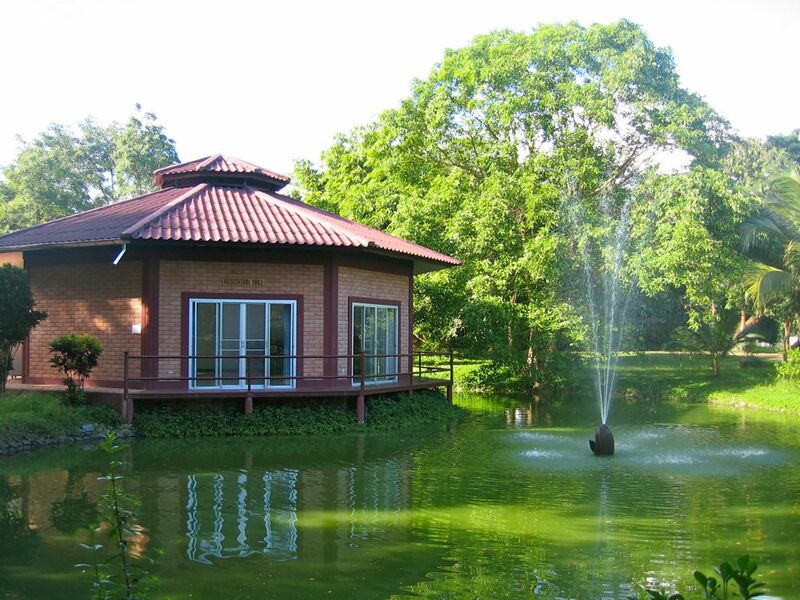 The first building on the new eco-campus of the Dharmalaya Institute is just two steps away from being ready to welcome the public, and Dharmalaya needs your help to reach the finish line. The neotraditional adobe-and-bamboo building survived its second heavy monsoon season in perfect shape, thanks to the dedicated team of Himachali craftsmen, local labourers, and many Indian and international volunteers who did great work last spring to complete the roof and the most important windows from March through June. Yesterday was the first slow, leisurely day i’ve had since i left India two months ago… and now, after a whistle-stop tour of my world in Oakland (mostly my desk, truth be told), i’m finally catching up on missed breaths, and feeling grateful to be exactly where i am. Spent most of the last week within a few blocks of my beloved Hoan Kiem Lake in Hanoi. Yes, the sequel! We’ve returned for another round of recording and filming, and oh am i glad we did! The reunion with our Vietnamese musical-kung fu family was very sweet — and somehow even warmer than before. No committees, no toasts, just love and music. Felt like coming home to family. 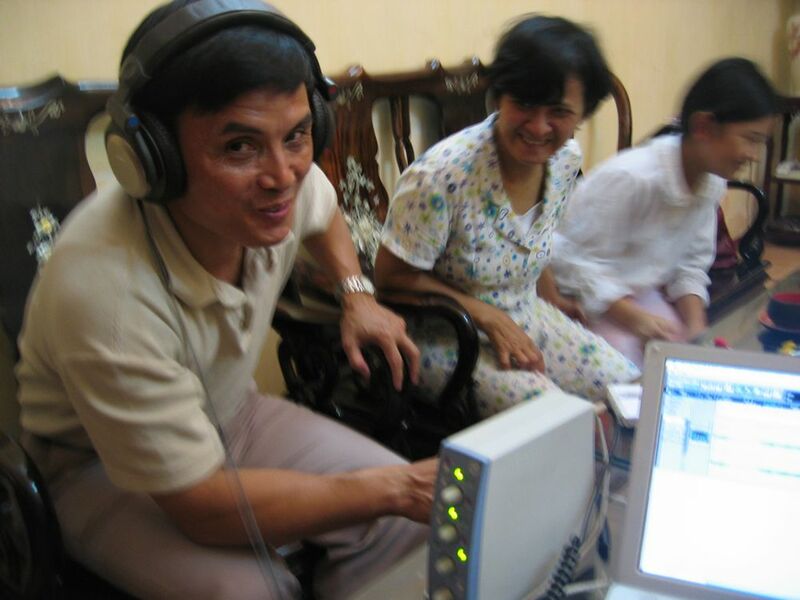 We recorded in a well-appointed home studio run by a new friend, Ho Hoai Anh, who is a very popular musician in his own right but, like his elder Khanh, is very down-to-earth and can’t be bothered with protocol. Hoai Anh was a godsend as a second engineer, helping to keep us all in sync with graceful technical and cultural translation. The result is a solid hour of good performances, cleanly captured, and i can’t wait to get home and mix them. 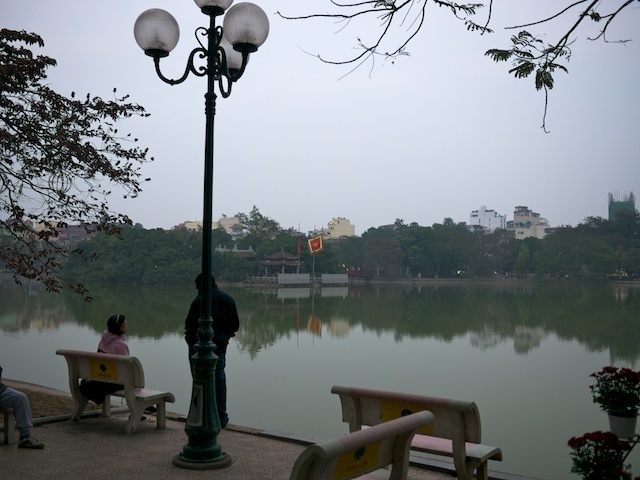 On the inner plane, the big news in Hanoi was my reunion with Hoan Kiem Lake. Saw familiar faces there — others who, like me, seem drawn to her, sit facing her, in silence. The old folks, doing what matters most. Young lovers, in pairs and alone, longing. The tai-chi ladies with their fans and swords. The kung-fu dudes whacking their wrists and forearms against the poles to toughen themselves up, and eyeballing the growth of each other’s muscles. A woman in her 60s, with a condition that renders her helpless as an infant, being held by her husband or brother, who every day brings her to the lake, lovingly feeds her on the bench, then takes her walking Butoh-slowly around the water. I don’t know how to explain, except to say that, somehow, the spirit of that lake is one of my best friends in this world. Doing my morning chi kung with her, strolling around her, or just sitting by her banks, i feel more like me. Kinda wish i could take her home in a bottle, but she definitely lives in my heart. I notice that when i’m so deeply peaceful i don’t need to eat much. The food here is divine, but i feel so nourished by everything else around me that my (famously enormous) appetite for gourmet Asian vegan grub is quickly satisfied, despite the fact that i’m quite physically active. This is in sharp contrast with my life in the city, where i’m often moving only my eyes and fingers (and the hard drive in my head) yet feeling ravenous, insatiable. Looking deeper into these contrasts, while my perspective is fresh, i am humbled in recognition of the undeniable power of place. I could be doing the same thing with the same attitude and intention in a dozen different places and have a dozen utterly different experiences. Just being in a city makes me hungry, even when by all appearances i’m not doing much… but in the light of contrast here i see the truth is i am doing a lot when i’m in the city, just being there: my system is being bombarded with myriad stimuli, and of course it’s going to react, and those reactions burn energy. But, as Marshall McLuhan aptly put it, “whoever it was discovered water, you can be sure it wasn’t a fish.” We become desensitized to what is all around us, to the point where even some of the biggest influences on us can become invisible. It seems i’m getting a tiny bit better at it. Though i certainly didn’t arrive at Tao Garden this time in the same great shape i was in when i left it last October, i clearly did arrive here in much better shape than when i arrived last time. That’s something. But, inevitably, i have to ask: why leave? I’m feeling more motivated than ever to build community in nature. It just works. Yo ho ho, a village life for me. Speaking of the village life, a week from now i will transplant my retreat from the manicured majesty of Tao Garden to the fertile terraced slopes of Sikkim. I’ll be in India till mid-July, doing a combination of creative and meditative retreating and project-related advancing, starting with the former and ramping up to the latter. At some point (dates still in the air), i’ll be heading back to the land in the West Bengal Hills to meet with Ani Sonam La, her family, and our South African friends to take the next steps on our project there. For the last week of May and most of June, i’ll be very, very far from the Internet (yes, there are still a few places it doesn’t reach), so if you don’t hear from me again till July (which is likely), well, no news is very, very good news for this flower who blooms in stillness. Sawasdee khap from the Universal Tao Garden, home of the Inner Smile and observatory of the Microcosmic Orbit, where you can avail of free Wi-Fi access sipping garcinia tea in the dining pagoda while waiting to get your chi circulated, your blood ozonated, your arteries chelated, and your colon irrigated — all before lunch, and all for less than a ticket to a Britney Spears concert. Those of you who are aware of my history of kidney trouble will no doubt be pleased to know that my once-dour renal twins are now glowing with a warm sapphire light, like the sun just below the surface of the clear ocean off Koh Tao… and, yes, as advertised, they’re smiling at me. In fact, it’s a full-on lovefest in my grinning gut, with all my internal organs beaming at each other like one of those sweet gooey connecty moments in the foyer or the kitchen for which our beloved Earthville House in Oakland has earned a well-deserved reputation. Tomorrow morning, after chi kung in the mango grove, i’ll get my dark-field blood scan, my nutri-energetics analysis, and my bio-electrographic evaluation so we can find out what my organs are so happy about. Then, as a bonus, i get my brain synchronized! It’s about time, is all i can say. In my morning sit yesterday, i unearthed a time capsule i had buried for myself back in ’96, shortly before we opened KhanaNirvana — a text i had compiled from my own translations of the Tibetan texts i’d been studying. I had shared with one of my teachers there (Geshe Sonam Rinchen) that i had found it difficult to connect authentically with some parts of the texts and, after some questioning, it seemed to be a matter of translation, so i was inspired to retranslate my daily practice texts in a way more resonant for me. He affirmed that my own translation would be potentially more powerful as a tool for me, provided the translation was accurate enough not to introduce distortions of meaning into the text i would be using as a guidebook. So, i took care to go over all the points in question with him and other teachers to check my understanding of the material, and then began composing this personalized practice guide. I never “finished” it: once we launched KhanaNirvana, i scarcely set eyes on any text that wasn’t a menu, a project write-up, a syllabus, or a spreadsheet for the next five years or so. Well, that old file is here on my laptop, and during my meditation i was inspired to open it up. [Bad in-joke for my vajra siblings: “short terma.” 😉 ] I spent the next few hours in waves of different flavors of tears, sad to have forgotten so much, but profoundly grateful for the reminders. Note to self: Always journal the epiphanies. You think in the moment that it’s so clear that you could never possibly forget, but then… Er, sorry, what was i saying? To follow up on my last post about changes in Chiang Mai, a friendly local i talked with at one of the wats shed some light. He started by telling me that the much-loved King Bhumibol made his way up north in 2003, which right away gave me a sense of how the town might have been scrubbed clean. Anyone who stayed in Dharamshala long enough to see the Dalai Lama’s motorcade make an exit from the temple compound that serves as his exile home know the scene: the faithful (and the politically liable) go aggro for several days leading up to the moment his car pulls out of the gate and onto the public road, picking up weeks or months worth of litter and throwing up a fresh lick of paint here and there. Likewise, when one of the V.V.I.P. Indian ministers is about to pay a rare visit, well, suddenly someone in the Public Works Department “remembers” that they had been given a budget for road repair several years back but it somehow got spent on chai and laddoos, so they pool their paan (betel) money, run out and fire up the tar car to pave the road, and suddenly the state of transportation leaps forward from the 17th century to, well, the 1950s. 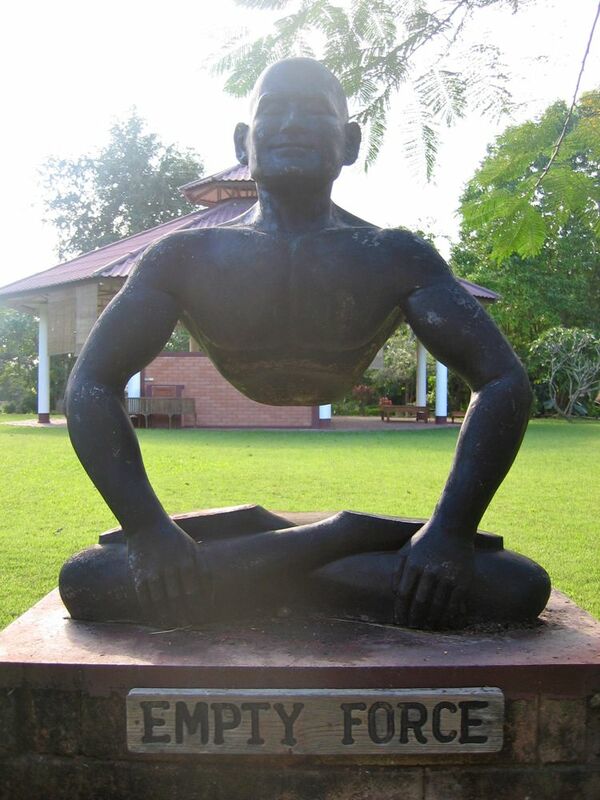 My Thai friend also identified one of the statues i’d been curious about — a sassy sentinel standing on one corner of the temple roof: “What in your country you call Cupid!” On a Theravada wat. Who knew? Fortune smiling on Chiang Mai as it may be in general, the economy has been sagging again since the Tsunami, due in large part to a precipitous 60% drop in tourism, and i did find a few folks panhandling once i finally made a foray to the spendier part of town. Some of them were clearly pros, raking in far more in a typical day than your average wage earner. On the advice of local social workers, i usually give the pros only smiles. But i found one gentle, clear-eyed young man with no legs sitting on his own, propped up against a wall and, since i figured he probably can’t hold a job and the social stigma adds insult to injury, i reached into my pocket for him. We had a short, sweet moment of connection, but since i speak very little Thai (poot Thai mai dai! ), i didn’t get to learn his story (which i normally try to do when there’s no language barrier). Food money and a loving smile… it feels so painful to want to do more, and to know the scale of the challenge is so daunting… but we can’t let that stop us from doing something. I spend most of my time working for change in the form of projects that take a long time to materialize, so it feels important for me to find opportunities to give something with immediate benefit as well — both so my legless friend can eat and so i can keep at least one little finger in touch with the way the other ninety-something percent lives. Both needs are valid and valuable, but mine is a luxurious abstraction and his is a churning gut, and… can i even imagine what his life is like? In any case, it’s clear that, whether he really needs my support or not, i need my heart to stay open to feel and active to serve. Enter your email address to subscribe to the glomad blog and receive notifications of new posts by email. ©2005-2014 Mark Moore, all rights reserved, except where otherwise indicated.